A Bird Hunter's Thoughts: Field Trials or Bird Hunting......or both? Judges ready for the trial. I do both, but, at times, it's a real pain. After hunting Montana and Idaho for 2 weeks, I will come home and turn the dogs loose in a field trail. It's hard on them to go from being semi-independent and using their heads to produce game, to staying in bounds, listening to the whistle and surrendering a lot of the independence. The birds smell different, the setting is different, they are leashed a lot more and expected to be 100% perfect immediately off the line. Yep, it's tough. However, the good ones make the transition quickly and easily. With a little preventative training, you can make it work, if that is your cup of tea. Many guys figure, "Heck, I'll just hunt my dog and not fool with all that." or "I'll just field trial every weekend, where I know the terrain and game. It's much safer and predictable!" I prefer to do both, but it's not without it's hazards. 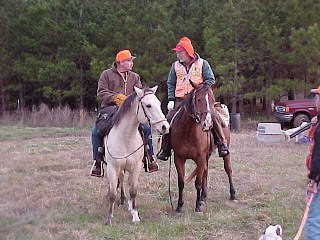 Typically, the hunting dog will come back in to the trial grounds "loose", meaning he's not as staunch and may even move on birds after the point. Or they may not pay a whole lot of attention to the whistle, or they may run by birds you know they should have smelled. 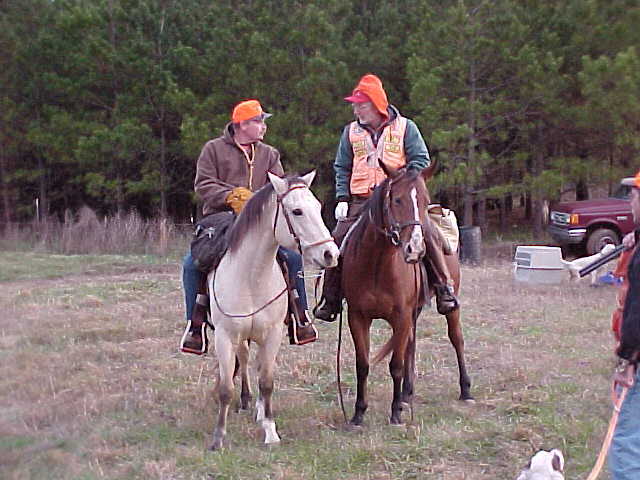 Usually, all these problems can be addressed before they ever leave the hunting area. I will ensure my dogs continue to back the other dog on point, no matter the terrain, etc. I will insist they turn when I whistle, and retrieve all the way to hand. I insist they are staunch on point and do not let them, ever, chase birds. In other words, I hunt them like I train them! That will keep the small adjustment problems from growing in to huge problems in the field trial. Notice, I've not addressed any problems going the other direction, from FT to Hunting? That's because the problems are usually small and self-correcting. For example, most FT dogs won't get out and range 400-600 yds ahead- more than that if game is scarce. But that is what you want them to do to locate the birds. After an hour of hunting, you will see them start to head out more and more, until they are making long casts, just like the big boys.